Treatment guidelines and suggestions for correcting Iron deficiency anemia. This is the last in our series on Iron Deficiency and Iron Deficiency Anemia. In parts I, II, III, and IV, I talked about all aspects of the essentiality of iron. How to diagnose iron deficiency anemia. Various controversies surrounding iron supplementation. And the relationship of iron to various inflammatory states including cancer. Let’s recap this series with specific treatment routines. I encourage you to read this final wrap-up containing new and revolutionary medical paradigms. I want to introduce one more refining and overriding concept. A new paradigm shift in medicine. Functional Medicine. We need to rethink the entire subject of iron deficiency and anemia. How and when do we recognize the condition of iron deficiency and progressive anemia? And then what triggers our decision to treat – or prevent? In America I see two competing medical paradigms. Structural pathologic medicine based on illness and disease. And functional medicine which is based on dysfunction, suboptimal values with the goal of restoring health and wellness. The goal is not identical. It leads to totally different approaches for you, the patient. The functional approach to iron therapy realizes various degrees of iron deficiency rather than a binary choice. “In the box” or “out-of-the-box.” You’re either low or you are high. In reality virtually all medical paradigms follow a normalized distribution. A continuum from very low to very high. The goal is always optimal — in the middle — values. This is a concept stressing to all my audiences 20 years. Fortunately, a new model is proposed and advocated in a major publication in the Austrian literature. This paper lays out guidelines for treating iron deficiency anemia in cancer patients using absolute (AID) and functional (FID) iron deficiency. Seemingly two sets of criteria. Anemia is common in cancer patients . From a practical viewpoint, two forms of iron deficiency need to be differentiated: absolute iron deficiency (AID) and functional iron deficiency (FID). AID is defined by a TSAT < 20 % and a serum ferritin level < 30 ng/ml in otherwise normal individuals, while in cancer patients a higher cut off level of ferritin levels should be applied (< 100 ng/ml). FID is defined by a TSAT < 20 % and serum ferritin levels of > 30 ng/ml in normal individuals and of > 100 ng/ml in cancer patients. Great. Here is a clear path. The Austrian literature articulates a major shift in modern medical thought. That is my purpose in writing series for you. Iron therapy is anti-angiogenesis preventing neo-vascularization. I see so many patients who are relatively anemic and are symptomatic. But they still fall within the “normal range.” And are therefore dismissed. Not falling within the treatment guidelines. Ready for the paradigm shift? 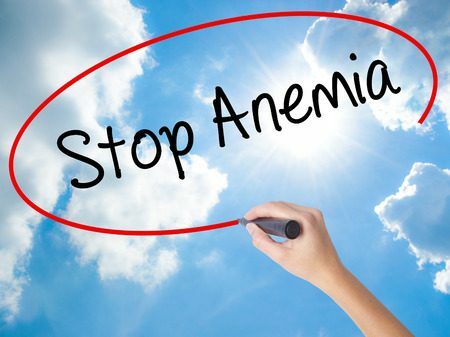 Now remember from the previous blogs that iron deficiency will proceed anemia. 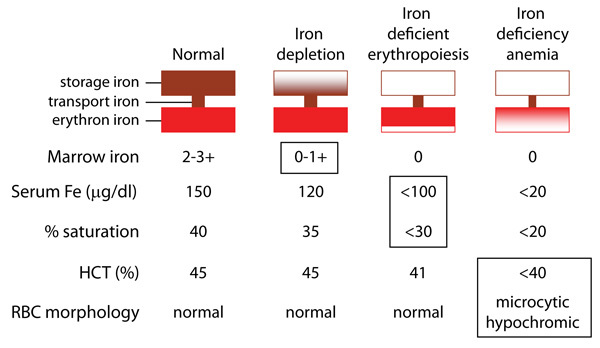 So here is the continuum of iron from fully sufficient to deficient that precedes anemia . This is a functional view. We want optimal values. Anemia appears only after more severe iron deficiency progresses. Once iron falls to more severe levels. Conventionally, your diagnosis of anemia must meet these standard criteria. Hematocrit values < 35% (women) or <40% (men). Or Hemoglobin values <13 in men or <12 in women. Remembering that hemoglobin is oxygen carrying capacity. But in reality, you won’t be diagnosed or treated until values fall even much lower. At that point you are really sick. See figure 2 for “normal values.” You want optimal values. This is a re-cap and wrap-up of the previous blogs. All preceding blogs give you a more in depth look at all the issues of iron therapy. How do we treat knowing that earlier intervention is essential? The total daily dose for severe cases is 180 mg of elemental iron. I usually use lower doses. You will need increased doses of magnesium to prevent constipation. Heme vs non-heme iron sources in food. 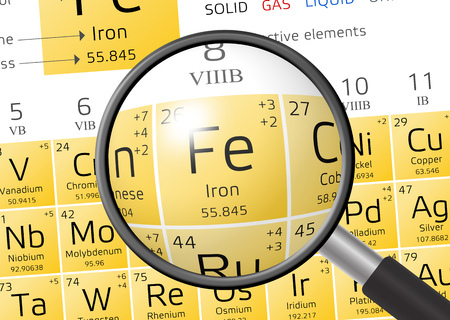 Heme based sources of iron is the most efficient. Best source is red meat or chicken livers or sardines. Non-heme sources, plant based is a less efficient source of daily iron. Ferric carboxymaltose (injectafer) — the most potent and effective for severe cases and those not responsive to oral consumption. You will need to find a sympathetic and creative hematologist to administer and infuse parenteral (im or iv) iron. A hematologist who is willing to treat early and not late in the process. Ludwig H, Müldür E, Endler G, et al. Prevalence of iron deficiency across different tumors and its association with poor performance status, disease status and anemia. Ann Oncol. 2013;24:1886–92. Iron Dosing for Optimal Absorption: NEJM Journal Watch Oct 30 2015.